DermaLife K cell culture medium is optimized for culturing Human Epidermal Keratinocytes in a serum-free environment. DemaLife K supports the growth of these cells over a period of at least 15 population doublings. DermaLife Basal Medium contains no antimicrobials and no phenol red. 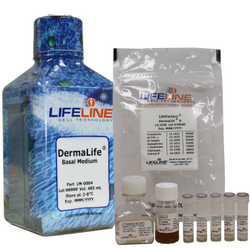 DermaLife K medium is offered in a kit format composed of DermaLife Basal Medium and associated supplements and growth factors called LifeFactors®. With this kit, you can prepare fresh medium to enhance performance. DermaLife K Serum-Free Medium grows Human Epidermal Keratinocytes and Oral Keratinocytes through at least 15 population doublings at rates that meet or exceed other commercially available serum-free media while maintaining excellent cell morphology. In comparisons with other commercially-available media, DermaLife K shows superior proliferation of epidermal keratinocytes at different seeding densities. Shown left: Human Epidermal Keratinocytes, passage 2, 5 days after inoculation with 2,500 cells/cm2 (100X). Shown below: Human Epidermal Keratinocytes inoculated at low seeding densities in 24-well plates. Higher fluorescence represents a greater number of cells per well, and therefore, better proliferation. Lifeline® Cell Technology manufactures products using the highest quality raw materials and incorporates ISO-style quality assurance in every production run. Exacting standards and production procedures ensure lot-to-lot consistency. Every production lot of DermaLife K Medium is extensively tested using normal human keratinocytes. The specially designed shrink label works as a light barrier to protect medium from light damage. A barrier sleeve helps protect the medium from contaminants found in the water bath.